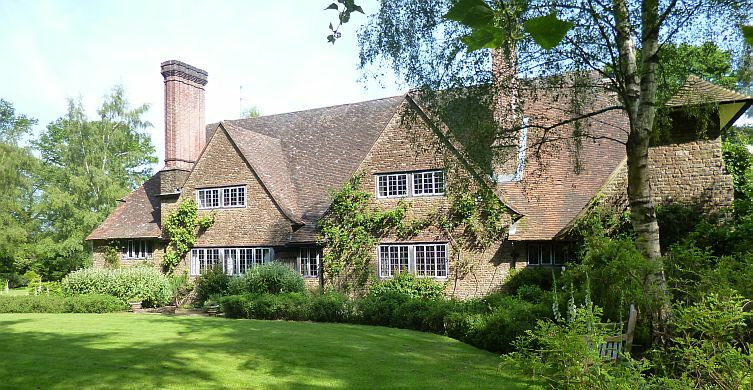 Munstead Wood, the home of Gertrude Jekyll (1843-1932), is in private ownership, however the garden is open by appointment only, Monday to Friday from 9.30 to 3.00 pm (excluding Bank holidays) from 1st April to 30th September. Both house and garden are Grade I listed. The house, which is not open to the public, was designed by a young Edwin Lutyens and constructed from bargate stone and other local materials. Miss Jekyll incorporated many of her own ideas into the design, all of which add to its charm. It was completed in 1897. The garden was created on heath land, some thirteen years before the house was built, during which time Miss Jekyll lived next door in The Hut. The Nut Walk, which is under-planted with hellebores, comes into flower in early spring. This is followed by the Primrose Garden (April), the Spring Garden (April/May), the Azaleas and Rhododendrons in the woodland (May), the Three Corner Garden (June) and the Main Border (July – October), Michaelmas Daisy border (October). PLEASE NOTE: We can no longer accommodate coach groups. Groups of up to 15 are welcome. Minibus and car parking on site.